LONG BEACH — It was last ditch efforts and comebacks on the racecourse during the final day of racing at the 2017 Zhik 29er World Championship regatta at Alamitos Bay Yacht Club. For a pair of Aussie ladies, a bullet in the second race of the day said “Don’t count us out yet”’ For the team of Benji Daniel and Alex Burger (South Africa), it was a comeback race that sealed the deal. And for a young man from Ireland, it was the prognosis of a full comeback after a near tragedy on the racecourse. Daniel and Burger were crowned the 29er World Champions today – after an uncharacteristic bottom-half-of-the-fleet finish in the day’s second race, threatened their success. At the start, they grabbed the lead and never let go; until Daniel dropped the tiller and slid backward into the water 20 yards beyond the finish line. The two waved in the other competitors and raised the South African flag over their boat, later hoisting it atop the mast, before sailing into the harbor. Finishing with 56 points, the second place team, Benjamin Jaffrezic and Leo Chauvel, France, were also recognized as the reigning Youth World Champions, 18 and under. Only two points behind were fellow Frenchmen, Theo Revil and Gautier Guevel, to fill the podium. Six days of spirited competition took place under varied weather conditions and unfamiliar conditions that tested their strengths and exposed weaknesses. From the light and fluky air of early week, to yesterday’s brisk breeze, to the pleasant 8-knot zephyrs that graced the fleet during today’s final races: capricious conditions kept the racers on their toes – and on their wires. The regatta featured 129 teams from 17 nations competing in the six-day event: three days of Qualifiers followed by Finals, Thursday, Friday and Saturday. An incident on the racecourse nearly marred an otherwise idyllic regatta; but others on the water came to a swift rescue. After winning Race 10, at the top of Race 11; Ireland’s Johnny Durcan and Lola Kohl capsized during a frenzied mark rounding, trapping Durcan, 16, beneath the skiff. Kohl called for help, and the fleet responded. After the rescue, ABYC’s emergency protocol kicked in, said Clay. Each course had a dedicated Medic and Safety Boat, and procedure. Long Beach Lifeguards were called to assist, and transported Durcan to shore and awaiting paramedics. Australia’s Annabelle Davies, 18, and Madison Woodward, 17, tied for 18th place going into the last day, clinging to hopes of winning the top female team award; with Tania Bonilla and Nuria Miro, ESP, just three points behind. It was apparently just what the doctor ordered. At the next start, the Aussie gals sprinted off the line, trading leads with Bonilla and Miro, with Catherine Lindsay and Jana Laurendeau, United States, just astern – all the way around the course. 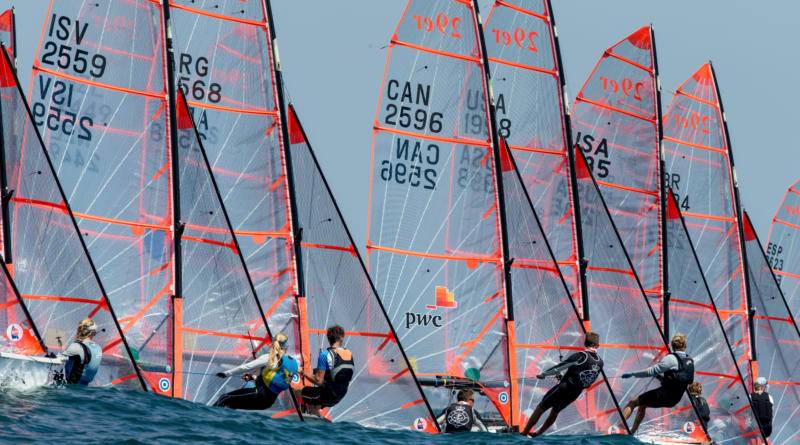 Alie Toppa and Jacob Rosenberg were recognized as the leading US entry, finishing seventh place in the highly competitive Gold fleet; having won the 29er National Championship title last week. Americans elsewhere on the podium: Paris Henken/Christopher Williford took second in the Silver fleet; sandwiched between New Zealand’s ‘Green Machine’ Ben and Sean Paterson, first, and Craig Keenan/Reece Caulfield, third. Morgan Pinckney/Michael Sabourin finished a close fourth, with the Wilmot sisters – Lucy and Sally – eighth. It’s been a dozen years since the US has hosted the 29er World Championships – but hopefully not the last. With the 2018 event scheduled in Hong Kong early next year, and the championship moving to Europe after that, it’s hoped that 29ers will return to ABYC before the rosy glow of a successful event wears off.